Once upon a time I planned my food preservation according to how much of each food item I would need until the following harvest season. If I wanted to use a pint of pickles per week, then I would need 52 pint jars of canned pickles. 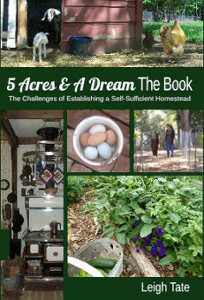 It was a logical system, I thought, that should give me enough for year-round homestead eating. Enter REALITY. The fact of the matter is that everything doesn't grow consistently every year. For a myriad of unfathomable reasons, some years are better than others when it comes to the harvest. So my philosophy changed. Now I just put by everything that's available and do some creative menu planning to suit. This year's blue ribbon bounty winner is cucumbers. I had one volunteer plus planted a 16-foot row of them. Before the row I planted ever produced Cucumber One, we already had more cucumbers than I knew what to do with from that volunteer plant. We eat them at both lunch and dinner, I feed them to the chickens and goats, and I've been making pickles. Trouble is, we don't need a decade's worth of pickles and relishes. 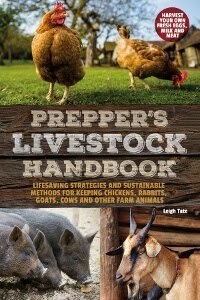 So I was casting about for something to do with the extras when I remembered a book I reviewed awhile back, Prepper's Dehydrator Handbook. One of the food items in it is cucumbers. So that's what I've been doing with our many extras. Because of our high humidity this summer, it took a lot longer to completely dry the cucumbers than the book's suggested time of 4 to 6 hours. It took me more like 12 to 24. I also learned that I need to put these up as soon as they are cool. If I don't, our humidity makes them limp again in a very short time. After I put them in jars I vacuum seal them. (Details on how to do that in my "Dry-Pack Vacuum Canning" post.) The vacuum sealing keeps them fresh and keeps pantry moths out! I kept some of the dried cucumbers in slices, some I powdered flaked. What will I do with them? I'm not sure! The Prepper's Dehydrator Handbook has recipes for dehydrated cucumber pickles and cucumber salad dressing, so I will be sure to try those. How about you? Have you been preserving anything unusual lately? Something new for you? If they were salted during drying, would they make tasty snack food? I think Michelle is onto something. Cuke Chips We may have a winner here Leigh want to give it a whirl? It has been so long since I reviewed my canning guidelines would you know the drop dead expiration use date for pressure canned veggies? I stumbled across some older beets that look fine, seals are fine . Hate to dispense of them if they are edible. Michelle, I don't know about the salt, but some people do make veggie chips this way. Mine thin sliced dried veggies never stay crisp long enough to make appealing chips. Perhaps in a drier climate! Goatldi, I think it depends on whom you ask. Grandpappy has a webpage (here) that links to several studies that have been done on old canned and dehydrated foods. The results are extremely interesting. It's apparently a whole lot longer than most people think! Really excited about this experiment. I love cukes, plant too many every year, don't really make pickles and have always moaned that this doesn't seem to be any way to save the excess. Looking forward to your re-hydration experiments/recipes. (P.S. - dehydrated does last long - I still sprout seeds from tomatoes dehydrated in 2009 every year). I really wish I was preserving something - bad year for us. I do dehydrate a lot when I do have a good harvest. Yep, that was my question while reading through your post: What are you going to do with the dehydrated slices? I always end up giving away LOTS of cucumbers, it seems. I wouldn't be tempted to make them into pickles 'cause I grow pickling cukes and make (more than) my quota of pickles from them each year. Ground and in a dip? Sounds promising. Up until a couple of years ago when we decided we were tired of them (I do get carried away with quantities), I sliced and dried larger zucchini, seasoned them with garlic salt, pepper, a little red pepper, whatever might be your choice before drying. They came out crunchy and stayed that way kept in canning jars with ring and seal covers. Trouble was we would never eat as many as I put by! So you could try that with your cuke slices if you wished. I'll be eager to hear what you do with them during the year. Keep us all updated! Kris, I'll be sure to do a follow-up post on rehydrated cucumbers! Very interesting about growing tomatoes from dehydrated seeds. I always wondered about that. I'm amazed at the viability! I wonder if anyone has seriously studied that. Kristina, yes, those bad years have taught me to preserve everything I can get my hands on! I don't do a lot of dehydrating but that's changing. Next I'm going to try dehydrating okra. Mama Pea, thank you for that! You've answered Michelle's question and given me something new to try. I'll probably be doing some experimenting with the ones I have dried. I can always toss them into soup! This is a great idea - being one person, I am still enjoying B&B pickles I made two years ago! I like the idea of cucumber chips - I think I will try some. Maybe you can spiral/noodle cut the cukes like zucchini pasta? A friend of mine mentioned dehydrating cucumbers to me too, I've never tried it. Of course this year, it's a bumper crop pf bush green beans and not enough cucumbers. The squash beetles decimated my cucumber plants. Susan, I have a several years supply of pickles as well. :) Drying cucumbers will hopefully add a new cukey dimension to our diet! Unknown, that's an interesting idea. Definitely one to try. Cockeyed Homestead, that's a shame about your cucumbers! Funny how some years are bumper crops and others are slim pickings. Exactly why to preserve as much as we can, any way we can. Nancy, I'd never heard of them either until I read that dehydrating book! We'll see! Phil, the soup idea sounds like a good one. I'll have to give that a try. We eat soup almost every day in cold weather. drying is not a good idea in our climate - first it doesn't dry properly and of course, because of that it doesn't store well... I don't have enough to make investing in a proper dryer and vacuumer worth our while! I don't know anything about dehydrating cucumbers, but there are lots of yummy sauces/condiments that have cucumber as their flavor. Maybe try putting the flaked cucumber (or powdered) into some mayo (a good use of eggs! ), or look up a good tsatziki sauce. I wonder what the dried chips would taste like if you lightly seasoned them and fried them a little? Or a crunchy cucumber sandwich with mayo? I was wondering what in the world a dried cucumber could be used for. Yours look good enough to eat as a snack. Bettina, I have to say that I've never had this many cucumbers before! And I don't usually dry things, but I have enough pickles and have run out of other ideas! Interesting about the barberry. I wonder why the one batch turned out the way it did and others haven't (???) Always something strange to figure out! M.K. I'll definitely have to do a little research for recipes! And good idea to try the dried chips fried. Maybe I'll try cucumber oven chips. Who knows, we may have a new favorite! Henny, I'm getting some good ideas for them including snacks! I have been doing the same this year. Plan on doing cucumber soup, salad dressing and ground and powdered added to veg soups. Also used homemade powdered basil plus salt and fresh ground pepper on the slices prior to drying and they make the best healthy snacks, friends love them. I also immediately put them in jars and vacuum seal due to high humidity. Bumper pear crop making dried pear-cinnamon-sugar snack chips in dehydrator. Pricket, great information! Thank you for that. I will definitely have to try seasoning before drying for snacks. Love the idea of the pear snacks too. One of the most delicious thing I've ever eaten was a cold cucumber soup. I bet dried cukes could be used for that, and for dips, too. Quinn, I've never tried cold cucumber soup but it sounds really good! Cucumbers are so cooling anyway, that this sounds like an ideal lunchtime meal. Thanks for the idea!